Home Last month I briefly touched on the topic of how much your bucks really cost you, and will go into more depth this month. I find this topic interesting because in the cattle business most producers recognize the importance of investing in good bulls, but in the commercial goat business many producers seem to view bucks as an expense, not an investment. This point was driven home recently in a discussion I had with another livestock dealer who I was trying to convince to purchase some of my bucks to put with some does he purchased for sale to a producer as a commercial herd. He said, "Martin most of these ranchers just want something to breed their does, then they want to get rid of them. Next year they will buy some different bucks so they don't have to worry about inbreeding. After breeding season they will do good to sell the bucks for slaughter for $100.00 each, so they don't want to pay much more than that." This attitude assumes several things that are demonstrably invalid. First, it assumes that all bucks are equal, so why pay $500.00 for a buck when you can buy one for $100.00. I guess if you view the sole purpose of a buck to be impregnating your does this might be ok. A $100.00 buck will certainly do as good a job of impregnating your does as a $500.00 buck. Unfortunately, the amount you receive for your kid crop is dependent on several factors. Some of those factors you as a producer have control over, and some you don't. The quality and size of the kids you produce is one factor you can control, and is heavily influenced by the quality of your sires. I have discussed at length in previous columns the impact that sires from lines that are proven to grow at faster rates can have on your bottom line by producing more pounds of kids faster, so I won't cover that again here, but the sires you select affect other areas as well. If you look at the performance test results you will notice that in addition to rate of gain there is a measurement for ribeye area. You have to be careful when looking at ribeye areas because larger goats should have a larger ribeye, so you need to adjust the measurement for the size of the animal. For instance, a 1.9 inch ribeye area is average for a 105 lb buck, but would be outstanding for an 80 lb buck, and poor for a 130 lb buck. 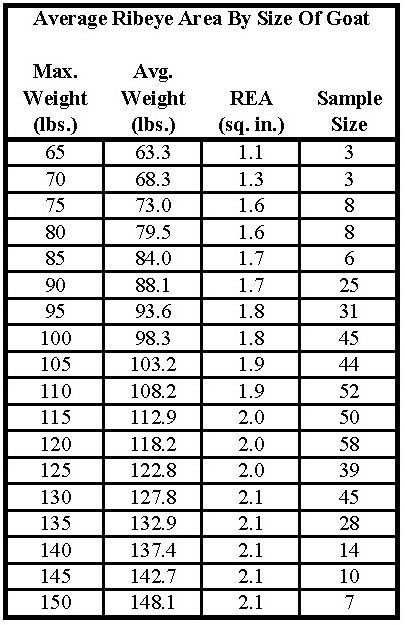 I have included a table showing average ribeye areas for different size goats. I developed the table using data from 5 years of performance test data. As you can see ribeye areas increase rapidly as the bucks grow then virtually stop increasing once they reach 115 lbs. How valuable is this information when selecting a sire? Over the years I have used several criteria when selecting my own herd sires. One of those criteria has been to select sires that have above average ribeye areas (REA) for their size. This year I tested 39 bucks. Of those 39 bucks, 33 came off test with above average ribeye areas for their size, 3 had average ribeye areas for their size, and only 3 were below average. The 3 that were below average were only below by .1 sq. in., and 2 of them were animals I culled after the test because they only had one testicle. You have to wonder if their smaller REA had anything to do with them only having one testicle, and thus less testosterone production and less muscle. In the REA rankings for this year's test 14 of the top 21 bucks (66.67%) were from my herd. This would seem to indicate that REA is a highly heritable trait, and can be increased by selecting sires that have above average REA. A large REA is not a trivial matter. The two factors that determine how much your goats bring when you sell them are weight and grade. The grade is determined by looking at the condition of the goats and the amount of muscle on the goats. REA is a measurement of muscle, and kids with larger REA's should grade out higher than kids with smaller REA's. The difference in price between a Selection 1 kid and a Selection 2 kid is typically about $.10/lb and the difference between Selection 1 and Selection 3 is generally $.20/lb. Therefore, a sire that produces 50 Selection 1 kids that you sell at 60 lbs each is worth $600.00 more per kid crop than a sire that produces Selection 3 kids, and that same sire is worth $300.00 more per kid crop than a sire that produces Selection 2 kids. That extra income is purely from differences in grade. If the sire also produces larger kids that grade out higher, the differences become even more pronounced. For instance, if the sire produces 50 Selection 1 kids that wean at 80 lbs instead of 50 Selection 3 kids that wean at only 40 lbs, then the superior sire is worth about $2,200.00 more per kid crop. The superior sire's kid crop should sell for about $3,700.00 while the poor sire's kids bring a paltry $1,500.00. That extra income is almost all pure profit since the only additional cost to produce it is the extra couple of hundred dollars the producer invested in the sire. An investment that will be recovered the first year, but that will keep generating additional profit for many years. Which brings me to my second point. Buying cheap bucks because you are going to sell them after breeding season to avoid inbreeding any does you retain next year is ridiculous. Sure that is a problem if you are a small operation with 30 does and one buck. Any does you retain would wind up being bred by their sire. However, the producer I was discussing with the other dealer has a couple of thousand head, and needed over 60 bucks. Do the math. The odds of a buck breeding one of his daughters in an operation like that are about 1 in 60. Even if it happened, with quality bucks a sire breeding his daughter is not necessarily a disaster. If you take it a step further the odds of that sire then breeding a daughter from that breeding would be about 1 in 3,600. Those are pretty long odds. In larger operations it is not unusual for producers to break their herd up into smaller subherds. In a case like that the odds of inbreeding occurring can be reduced to zero by moving the does you are retaining from one subherd to a different subherd, and using the same bucks on each subherd every year. For most large commercial producers there is absolutely no reason to routinely sell your bucks every year, and start over with new bucks who were selected primarily because they were cheap. If you are doing that I don't know why you would want to keep any of the daughters anyway. For smaller commercial producers you would be better of investing in good bucks and buying unrelated replacement does somewhere else than buying a new batch of cheap bucks every year. Finally, what I typically find when I look at the cheap bucks that many producers are buying is that they have cull defects and/or faults that make them unsuitable for use as any kind of sire. I'm not talking about appearance traits that would only matter in the showring. The things I see are major problems. Using bucks that have bad bites will result in poor performance of both the buck himself, and any daughters that you retain from him that inherit that problem. Your typical commercial goat has to make a living out on pasture, and they simply cannot do that if their jaws are not aligned properly. Poor jaw alignment makes it difficult/impossible for the goat to eat grass and weeds. As a result the animal will get less to eat than the other members of the herd, and will lose condition. This loss of condition may cause a doe to produce fewer and/or smaller kids, fail to breed at all, or in severe cases die. Obviously, if a producer is using bucks with poor jaw alignment then retaining does with the same defect as replacements this will impact his bottom line. A cost most producers don't consider when they are shopping for cheap bucks. Another problem I frequently see is weak pasterns. This seems to be a highly heritable trait. I don't consider it a problem for the reason you might think. Most people theorize that a goat with weak pasterns cannot get around as well as one with strong pasterns. In my experience there is no significant difference in the ability of goats to get around based on the strength of their pasterns. The real problem is that goats with weak pasterns require much more frequent hoof trimming than do goats with strong pasterns. On my ranch the ground is so hard and rocky that the only goats I have ever had to trim hooves on were the handful of does that I had that had weak pasterns. I don't know anybody that likes to trim hooves. It is a time consuming and back breaking chore that most producers dread. If you have a herd of any size you will require hired help to complete the task, and that is an added expense that would not be necessary if you had goats with strong pasterns. If you neglect to trim your goat's hooves eventually some will become cripples that develop a goose step. Once they reach that point you have no choice but to get rid of them because they will not walk normally even if you trim their hooves, and their performance will be severely impacted. Either way weak pasterns will cost you extra money, and over time that extra cost will add up to more than the additional investment in good bucks that would produce replacement does with strong pasterns. Whether you have good does or bad does, investing in quality bucks is a sound decision. Many of the most important commercial traits such as growth rate, muscling, jaw alignment, and pastern strength are highly heritable, and can be improved or worsened depending on the type of buck used. A quality buck when bred to poor does will produce replacement does that are better than their mothers, and when bred to good does will produce replacements that are suitable for retention or sale to other commercial producers at premium prices. The slaughter kids produced by quality bucks should be larger and grade out higher at sale time producing extra profit that more than offsets the additional investment for the buck. Cheap bucks, on the other hand, are generally an expense, and will produce additional expenses and reduced profits for their owners. Their daughters will have poor jaw alignments, weak pasterns, and/or poor muscling resulting in them being unsuitable for use or sale as replacements, and if used as replacements they will require extra care and maintenance resulting in additional expense. Their slaughter kids will be smaller and grade out lower at sale time resulting in dramatically lower revenues and profits for the producer. Producers just need to decide whether they want to invest a little more up front for quality bucks or pay a lot later for cheap bucks, but there is no such thing as a free buck.